From Creative Breathing comes this adorable craft project using wool felt. 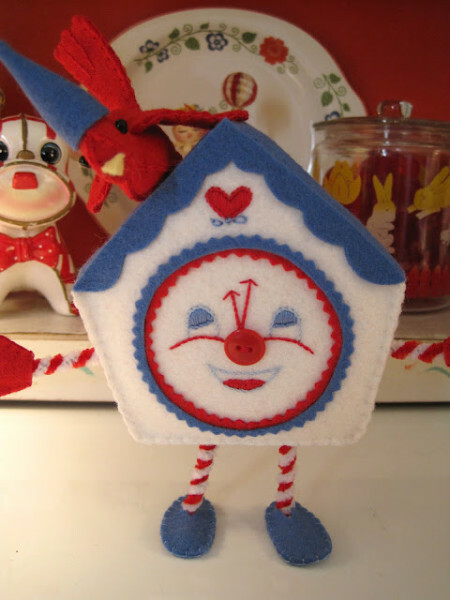 It’s Elizabeth’s Cuckoo Clock and she explains how she made it in an afternoon. Elizabeth creates and uses patterns that are but simple pieces, then ties them altogether to create something quite detailed. So, if this adorable guy doesn’t tickle your fancy, she’s got plenty more at her blog. This clock is perfect for a playroom, nursery, or as a gift for a mother-to-be. And he looks like he jumped right out of a children’s book! Get the pattern and follow the steps right here.